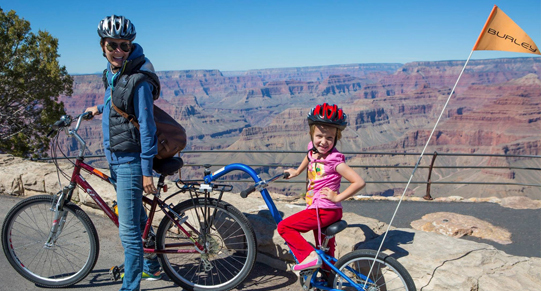 Headed to Grand Canyon with the family? Excellent idea! Be forewarned though – many people are simultaneously having the same great idea as you… and when you arrive it’ll feel a little bit like they all came on the same day. 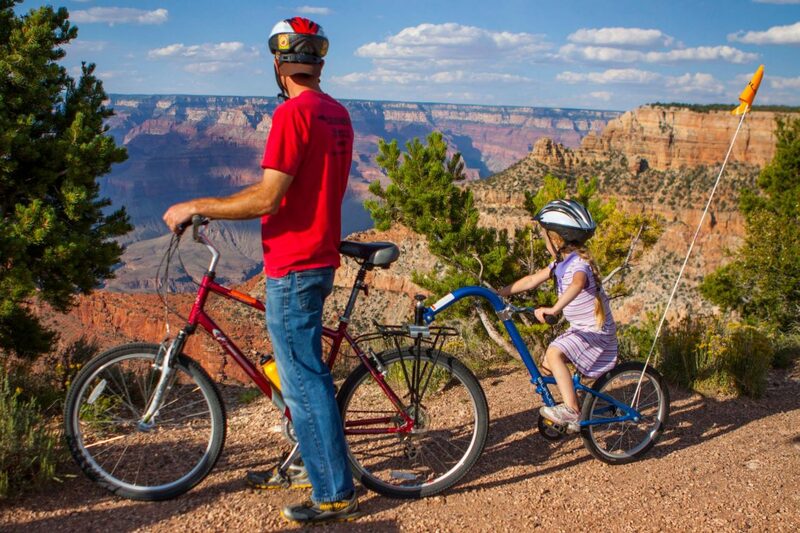 With a little planning however, Grand Canyon can be a relaxing and memorable experience for both you and the kids. When I moved to Arizona 10 years ago I saw the Canyon through the eyes of a tourist and now have known it intimately as a local. 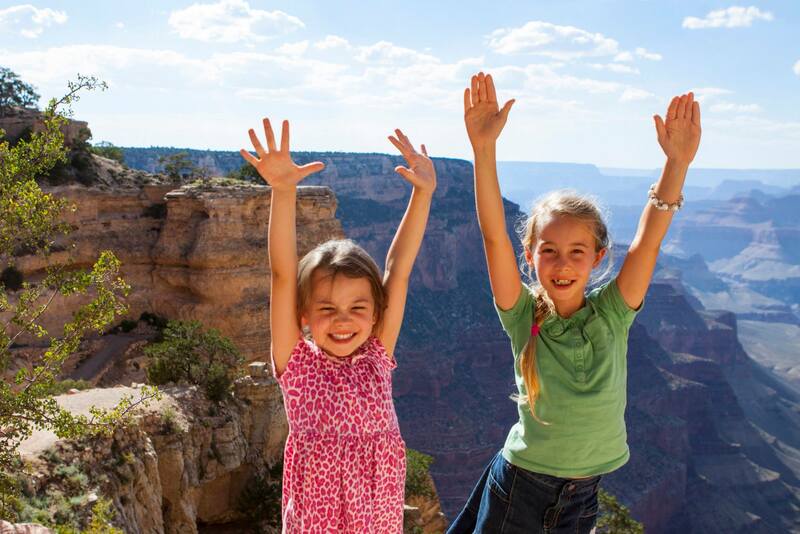 My 4 and 7 year old are Grand Canyon experts and we’ve tested just about everything it has to offer on them. 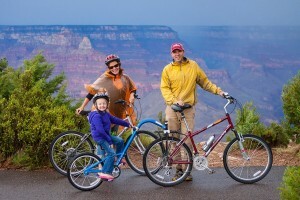 With this in mind, here is my suggested 2 day Grand Canyon itinerary if you have young ones on board. For transparency sake: All of my recommendations are unsponsored – no money involved… just things my kids have loved (and of course some plugs for our bike rental business). You can validate my claims at our tripadvisor.com site though for unbiased references! Supplies and Attire Required for Day 1: You’re going for a bike ride and doing some small walks. Dress in comfortable active wear and pack sweaters & rain jackets “just incase”. Bring toilet paper and zip locks for the long stretch of road with no bathrooms and snacks! A small backpack would be useful. Stroller if you have babies (although you can rent one at Bright Angel Bicycles) Sunscreen, camera and medications you use are a given right? Oh! And the park doesn’t allow bottled water sales, so bring your own! 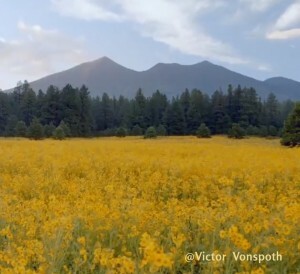 Starting Point: Flagstaff, Arizona. This beautiful quaint town sits at the foot of the San Francisco Peaks and boasts many incredible hiking, biking, and exploring opportunities of it’s own(watch the video). Our recommendations for hotels are Little America, the Drury, or Hotel Monte Vista. There are dozens of historic motels, but make sure you read reviews before you book – there are great ones and shall we say “lesser” ones. 8:00am: Eat breakfast at Martannes (phenomenal food! ), or grab a fresh pastry and coffee (the best you’ll ever have) at Macy’s or Tourist Home. 9:30 am: Depart for Grand Canyon. Drive via Fort Valley Road/US-180. This route will take you through the Aspen forests and past the foot of Arizona’s highest mountain. If you want to take the time to divert, you can drive up SnowBowl road which will take you to the ski resort and amazing views across the desert. (1 hour diversion). Diversion aside, You’ll descend through the meadows into the high desert. Merge onto highway 64 (where there is gas, snacks, toilets and some awesome vintage cars) and continue to Tusayan after your break. 11:30am: Arrive at Park Gates. Check in. If you have a 4th grader on board take advantage of the “Every Kid in a Park” program which will allow your family free admission. Be aware that especially in the busy summer months that you can wait 15-20 minutes in line behind other travelers. 12:30pm: Proceed to the Visitor Center. Head to Bright Angel Bicycles & Cafe next door where you’ll grab lunch and rent bikes (or tagalongs/trailers for smaller kids). Pick up a couple of fresh sandwiches and snacks to bag up for the trail or to eat while you’re waiting on fittings and safety talks. I have personally taken dozens (maybe hundreds) of children to do this ride and they adore it. 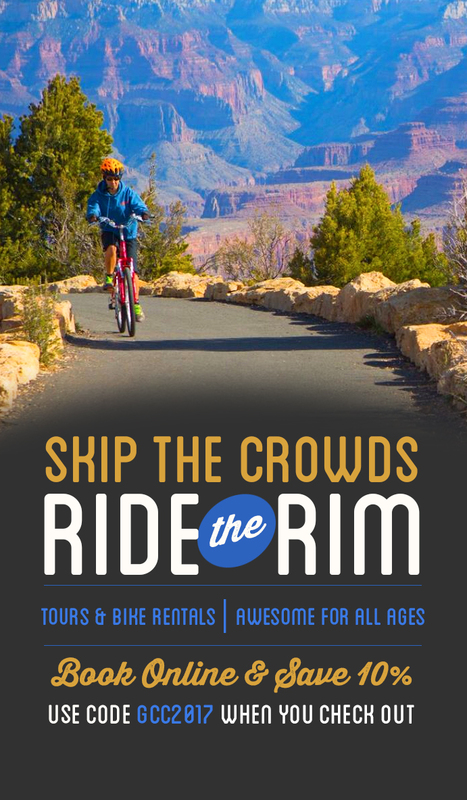 My personal recommendation is to either do the Orange Ride which departs from the shop, or get the Hermit Package which takes you up to the Hermit Road and will give you a lot of river views (worth it for a few extra bucks!). It’s REALLY not too difficult for most kids and adults. A very flat paved path and a couple of uphills which are easy to walk if you prefer not to ride them. Kids love riding in trailers if they’re little and you have the energy to pull them. Grab one of the shop’s self guided tour brochures before you leave and do the stops with your kids. It’s a great teaching opportunity. 3:00-4:00pm: Your kids will be pretty tuckered out after their ride. 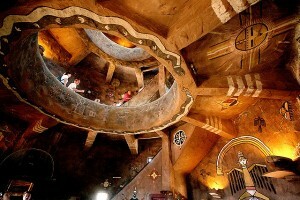 Our suggestion at this point is to head over to Bright Angel Lodge and get an ice cream or coffee. Lounge on the lawns and take in the view for 30-60 minutes. If you have a hotel reservation on the Rim (the Bright Angel Lodge has awesome cabins near this spot) this would be a great opportunity to sneak naps in. 5:30pm: This is where the itinerary requires a little planning. If you’re visiting mid summer the sunset happens at 7. If you’re visiting in fall or spring, it’s earlier. See sunset times through the year here. You’ll want to arrive 30 minutes prior to sunset time to watch the light show. Trust us… you don’t want to miss the sunset. Here’s our suggestion. If you’re visiting at an early sunset time either order a pizza ahead by phone in Tusayan, pick it up and bring it back to the rim to eat while you watch the “show” at Mather point (again at the visitor center). Or pack snacks for the kids to tide them over till after sunset and eat dinner near your hotel. 7:30pm: If you’ve already eaten, head back to your room for an early night, or find out about shows that the park has planned that evening. Supplies and Attire Required for Day 2: You’re going to do some walking today. Wear hiking shoes. Strollers if necessary. Rain or warm clothing. Snacks. Water. Sunscreen. 8:00am: Eat breakfast at your hotel or a nearby restaurant. If you’re inside the park and you’re willing to spend money, the El Tovar does an incredible breakfast and portions are big – adequately ” adult sharing size”. It’s a nice restaurant though so if your kids aren’t the kind that can sit still, you might want to grab egg McMuffins instead. 9:30am: If you’re inside the park, head to the Visitor Center to watch the free Grand Canyon movie at 9:30am. If you’re in Tusayan head to the IMAX theater and catch a showing of the IMAX movie which you’ll pay for, but for kids at least we feel is worthwhile. There are mixed reviews on whether this movie is cheesy or necessary. My kids LOVE it… and still ask if they can go see it when we drive by the theater. You can usually download coupons online for discount. So I’d say a yes. It’s a good overview of canyon history and shows the canyon from rim to river in a beautiful balanced way. 10:30am for Older Kids (a hike) : Here is where I’m going to give you a few directions to go. For teenagers, at this point we’d highly recommend a small hike below the Rim. If it’s mid summer, it might be a bit hot to do this in the middle of the day and you should re-align your day to start the hike at 7am rather than 10:30am. Either 1-2 miles down the Bright Angel Trail or Yaki Trail (steeper and better for seasoned hikers). Park at the Visitor Center. Buy a lunch to pack on the trail at the cafe . Take LOTS of water, more than you think you need. Wear a hat and thin long sleeves. Wear sneakers that are well worn in – new ones = blisters. (bring bandaids incase) Take a free Park shuttle to the trail. Aim to walk 2-4 miles total. This is probably something your kids might groan about in theory but will love once they’re doing it. It’s well worth seeing the canyon “in 3d”. Nothing helps you understand it’s scale like hiking into it. Grab lunch for the trail before you leave. 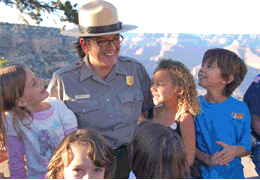 10:30am for Younger Kids 4-15 (junior ranger program) : During the summer NPS runs an awesome Junior Ranger Program that is well worth signing your kids up for. It’s free and teaches your kids about the Canyon at their level. You can find out more info about program times and content here. asy way to navigate the park. There are fantastic river views that you won’t access by car that you can see by “hopping on and off” the park buses along the Hermit Route. There’s an ice cream and snack bar at the end of hermit road where you can “refuel”. 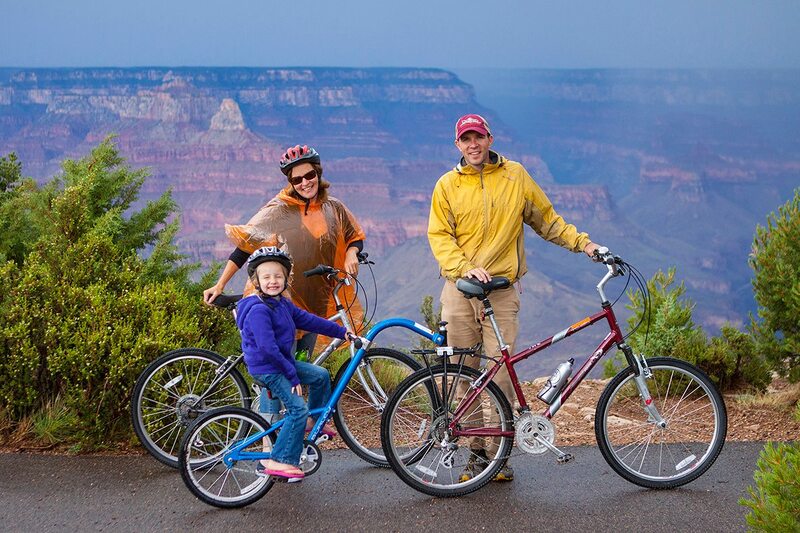 If you pick up lunch to go at the village or at Bright Angel Bikes and Cafe to take with you, there are wonderful picnic spots along the Hermit Road have a picnic at too. 2:30pm Head home on a different path than you came in on – the East Rim drive. Follow signs toward Desert View Watch Tower / Cameron. This is well worth seeing. 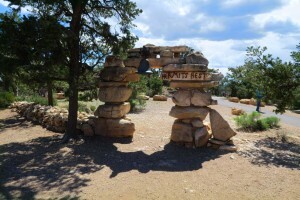 The Canyon’s appearance drastically changes and the highlight of the drive is the Desert View Watch Tower stop which kids LOVE climbing and seeing the view from. There is a restaurant, camp grounds and a gas station here are well for refueling. You can spend as much or as little time as you’d like here depending on everyone’s energy level – here’s more photos and info for the spot. 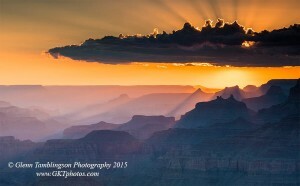 3:30pm Make a quick stop at Lipan Point if anybody still has the energy for another stop… the view is awesome. 4:00pm Drive back to Flagstaff through the Navajoland / Painted desert via Highway 89. Stop for photos in the grassy fields and “painted” buttes. See wild horses. Take in the unique arrid beauty that the desert offers. You’ll be getting back to Flagstaff around dinner time so we’ll recommend a couple of great dinner spots. Diablo Burger, Nimarco’s Pizza, Salsa Brava , Pita Jungle (Vegetarians and Health Nuts Rejoice), Burritos Fiesta (great hole in the wall mexican)and Wildflower Bread Company. You’ll likely follow dinner up with another hotel stay, or a drive back to Phoenix. Either way, whether you stuck to this itinerary in whole or part… you’ll have seen Grand Canyon in a well rounded way that most people don’t. Hopefully you saw a sunset, snuck in a hike or bike ride, and learned something. And you’ll likely have many great memories and photos to match. If you have questions or comments, post below and I’ll do my best to respond. Please click on the photos used on this post for their source. Special shout out to Glenn Tamblingson Photography. I’ll be dedicating a post soon to his Grand Canyon Photography Tours.